by Mark Ricard. Published January 2, 2013 in Issue 61. 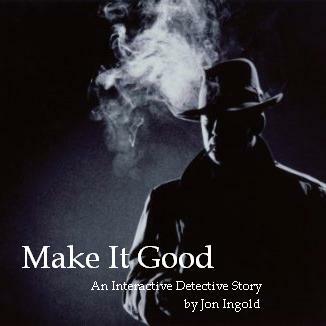 The plot and style of Jon Ingold’s Make It Good owes a lot to the Infocom classic Deadline, the game which really defined the genre. In this article we will compare these two games to see how this genre has been shaped over the last three decades. SPAG Specifics are in-depth discussions of IF works and can contain frequent spoilers. We recommend that you first play the works discussed if you are bothered by spoilers. In 198l, Infocom had a major hit on its hand with the first two games of the Zork trilogy. Zork, however, was an adaptation of the mainframe game Dungeon. It was not an original commercial game. Wanting to see if they could repeat the success of Zork, players were surprised when they came out with Deadline. 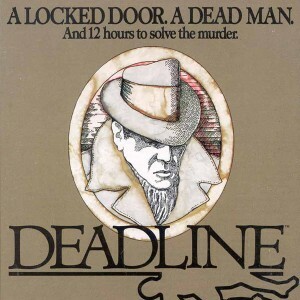 Deadline was an original game in many respects. While the original Zork games were a collaboration between Marc Blank and Dave Lebling, Deadline was the first solo game for Marc Blank. It was also the first game Infocom made outside of the fantasy genre. Perhaps most importantly, Deadline was the first game to come with “feelies”. Feelies are physical objects, articles, or papers that give background information about the story and characters. Deadline came bundled in a portfolio with a letter and an autopsy report of the victim, amongst others. In Deadline a wealthy businessman has died in his home by an overdose. The official verdict of the police and coroner is that his death was a suicide. Others, however, are not so sure. The player character is a police detective who is assigned to go to the house of the deceased and look for signs of foul play. The player also encounters other characters who knew the deceased. The detective has only twelve hours of story time to find evidence and accuse a possible suspect, hence the name Deadline. The player of course will discover that the victim’s death was not a suicide. To win, however, you must must find motive, means, and opportunity to arrest the right suspect. For a game from the early days of the interactive fiction format, Deadline holds up rather well. The NPCs are well developed but not deep as characters. They were innovative at the time for being able to follow their own schedule. The parser is not as good as later Infocom releases, and it lacks abbreviations for commands, such as x and z. It still contains a few guess-the-verb problems. The story for the most part is logical, and finding and analyzing evidence is straightforward. Any time you wish for an object to be analyzed, your assistant, Sergeant Duffy, will take the evidence to the lab. As a mystery, the story holds together without any major plot holes. One thing that makes Infocom’s mystery games interesting is that, unlike most puzzle games, both then and today, the puzzles rarely involve manipulating objects in a MacGyver-like fashion. Problem solving involves analyzing evidence and questioning suspects. Traditional adventure games puzzles are less common. This was a pattern that Infocom mysteries kept through Witness and Suspect. In each game, the player had to find both motive and means in order to arrest a suspect. In each game, there was an assistant who would analyze evidence for the player. And, in each game you were allowed to arrest the character when you thought there was enough evidence to convict him or her. This structure was unique for Infocom and, even more surprisingly, has rarely been used since. The design of Deadline does have one major flaw that makes the game not only hard but unfair by modern standards: it requires the player character to be in the right place and at the right time to find important information. One has to play many times to know where and when to go, unless you use hints or a walkthrough. There is one trigger event in particular that is extremely unfair, because the timing is so tight that you can easily not know you missed the necessary event — let alone know it is necessary. Being a mystery, the solution should rely less on events outside out of the player character’s control, and more with the player’s ability to make inferences from the evidence given. Despite its flaws, Deadline is a good game and an important part of IF history. Jon Ingold’s Make It Good clearly shows its inspiration from Deadline. The situations are similar: both involve a murder in the house of a wealthy man. In both, you have a limited amount of time to solve the mystery. There are a small group of suspects in both games that require being questioned. Both games give you an assistant who will analyze evidence for you. Despite these similarities, the styles of these two games are quite different. The player character in this game is a detective with a drinking problem who is in danger of getting kicked off the force. As in Deadline you have an assistant who will analyze evidence for you. Unlike Deadline, he treats you with contempt. In Deadline, your assistant would run any evidence you asked for into the lab. Here, if you give him an object that cannot be analyzed, he will refuse to help you. The puzzles also require a certain amount of timing. Make It Good is tough game, but it is more fair to the player than is Deadline. There are a few places were non-obvious actions are called for that may be hard for the player to think of, however it does not require any events that are so precise that one could overlook them. The most significant distinctive of Make It Good is how it plays with what the player knows compared to the player character, who initially knows far more than the player. This is a somewhat modern gimmick that goes back to Andrew Plotkin’s Spider and Web. Ingold himself used this in his earlier games Fail-Safe and Insight. The player has to learn not only what the other characters know, but what their own character does too. It is not obvious at first, but there are certain hints early in the game. The character you play is also much more morally ambiguous than the detective in Deadline. It requires the player to do a number of things that are unethical. In many ways, this shows the modern IF community’s interest in the art of storytelling. Modern authors are more interested in exploring techniques in narrative than many of those from the early days of IF; they are also more interested in characterization. It is hard to imagine Infocom ever having a player character like the one in this game. Infidel came closer than any of their games in having a morally questionable character as a protagonist. In many ways, the story is an inversion of the typical mystery game. I believe this is intentional on Ingold’s part. It often works. In some ways it does not. The weakest part of the story is the endgame. Having yet another surprise within the original plot twist is clever, but when you think about the facts, they do not quite fit what was discovered earlier in regards to a crucial piece of evidence. What perhaps is weakest about the ending is the fact that it leaves the plot dangling. This is perhaps intentional on Ingold’s part. The player is left to guess what would happen next — and then the game ends. Perhaps there will be a sequel someday. What Ingold has done is take the assumptions of the mystery game genre and turned them on their head. Like most modern day interactive fiction, storytelling is as important as puzzle solving. And, similar to some modern-day designers, he tries to use different narrative techniques to experiment with the medium. But despite the unusual nature of the story, the puzzle structure is a throwback to old IF, especially Deadline. Make It Good takes the puzzle style of Deadline while at the same time trying more modern storytelling experiments of new IF. In both terms it succeeds — but also sometimes fails. Oddly enough, the part of the game that I found the weakest came from the tension between the narrative technique and the nature of the puzzles themselves, showing that sometimes these two objectives can cause problems for each other. Regardless of its flaws, Make It Good is still entertaining both as clever game and as a story. This article was published in Issue 61 on January 2, 2013 by Mark Ricard. It is tagged SPAG Specifics. Thanks for the interesting article. I enjoyed both these games and found the comparisons to be well thought out. I hope you will continue to publish more stories about games, ideally providing more insights into what makes a game compelling. I’m particularly keen on ideas on how to craft a good mystery story. This article, lives up to the promise made in its title, though it is more like an appetizer tray than a full meal. I do not mean to be disparaging. On the contrary, being in the middle of authoring my own game, I found this article to be very, very thought provoking. I really appreciated the comments on the “art” of crafting IF puzzles, both then and now. However, I found myself wishing there was more flesh on those scattered bones. IMHO, this is a subject worthy of an entire future SPAG article. Same goes for the intriguing (but sparse) comments on the mechanics of telling a good mystery story through the medium of IF. How about it Mark? You write ’em, and I’ll read ’em. I wonder if the author would be willing to expand on the problems he found in the endgame? What is the plot twist within the plot twist, and how does it not fit into the facts of the case? And what plot thread is left dangling? I agree! This felt like the very well-written intro to a longer piece…or the first of perhaps three parts. Please break these games down, explore the plot details and the characters, and contrast how IF has changed in the time between! Perhaps even interview Ingold about his game and DEADLINE and what he drew from it and what he wanted to improve upon…as suggestions. More on the art and craft of good IF puzzles is always appreciated, especially if you include an in-depth analysis of what was effective or less so in specific games. Heck, maybe even include some Inform7 source code to show how it’s done. I would gladly buy a whole book on this topic. 😉 Maybe a follow up to the IF Theory Book? I have been meaning to expand upon the endgame part. When the detective comes home he rests and we see what really happened. Up until this point the player has been led to believe that the character we have been playing is the murderer. We have also set up a innocent girl. Now in this last scene we see what really happened. Our player was blackmailing the murder victim but he was in the room hiding when the murder took place. It was really the wife who killed her husband. There is a serious flaw in this scenario. When we examined the knife our player’s fingerprints were on it but no one else’s. There was no mention in the scene that the wife was wearing gloves either. And we never found gloves in the house. Therefore the wife’s fingerprints should have been on the knife but they were not. You also have to ask why we did not set up the wife up knowing she did it instead of the girl. There might be a few ways Jon could get out of this bind. It surprises me that nobody mentioned this before now. Maybe he could say she was wearing gloves he even though the text did not mention it. If I am forgetting anything feel free to tell me.